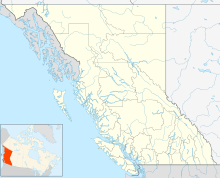 The West Kootenay Regional Airport, (Castlegar Airport) (IATA: YCG, ICAO: CYCG) is a small regional airport located 2 nautical miles (3.7 km; 2.3 mi) south southeast of Castlegar, British Columbia, Canada. It serves the West Kootenay region, including Castlegar, Nelson and Trail. It is owned and operated by the City of Castlegar, and has a 15,317 sq ft (1,423 m2) passenger terminal. Due to the mountainous terrain impinging on both runway approaches, there is no possibility of a straight-in approach. The airport is therefore certified for day operations only, and the glideslope on approach is set to a steep 5.0° rather than the standard 3.0°. The instrument approaches to Castlegar are considered among the most challenging of any in use at a commercial airport in North America. As of 2017, the Dash-8s serving the airport required minimums of 2874 foot cloud ceilings and three miles visibility (Air Canada Jazz adds 100 feet to these minimums). In 2006, Castlegar airport was developing departure procedures for night time operation, but as of 2010 the airport was certified for daytime operation only. A $1 million programme installed six beacons on the hills of the Columbia Valley that allow night-time take offs from the airport. It is expected this will only be used by air ambulances and medical traffic. The airport is classified as an airport of entry by Nav Canada and is staffed by the Canada Border Services Agency (CBSA). The customs at CBSA officers at this airport can handle general aviation aircraft only, with no more than 15 passengers. Wikimedia Commons has media related to West Kootenay Regional Airport. Past three hours METARs, SPECI and current TAFs for Castlegar Airport from Nav Canada as available.